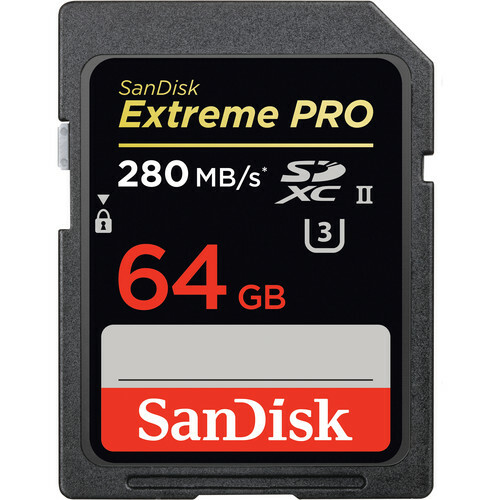 The 64GB Extreme PRO SDXC UHS-II Memory Card from SanDisk features a 64GB storage capacity perfect for storing a variety of files including RAW and JPEG formatted images, sequential burst shots, and even high-definition video. With a UHS Speed Class rating of 3 you benefit from the ability to capture uninterrupted 4K, 3D, and Full HD video at a minimum sustained write speed of 30 MB/s. This 64GB Extreme PRO SDXC UHS-II memory card supports a maximum data read speed of up to 280 MB/s along with a maximum data write speed of up to 250 MB/s allowing you to speed up your workflow through quick, efficient data transfers. As with most SanDisk cards, this memory card comes shockproof, X-ray proof, and waterproof, allowing you to take this card with you into some of the most grueling conditions. Should the card's data become compromised, you also benefit from the option to download RescuePRO Deluxe software as well as a limited lifetime warranty. Super Fast SDXC Memory CardThis 64GB Extreme PRO SDXC UHS-II memory card supports enhanced data read speeds of up to 280 MB/s to help you maximize post-production workflow efficiency. You also benefit from improved data write speeds of up to 250 MB/s, supporting advanced camera functions such as continuous burst, rapid shooting, and RAW plus JPEG capture. Â Â UHS Speed Class 3 RatedWith a UHS Speed Class 3 rating (faster than UHS speed Class 1 and Class 10) this 64GB Extreme PRO SDXC UHS-II memory card gives you the power to capture uninterrupted, cinema-quality 4K, 3D, and Full HD video at a minimum sustained write speed of 30 MB/s. Â Â Recover Deleted Photos and Videos with RescuePRO Deluxe SoftwareThe 64GB Extreme PRO SDXC UHS-II memory card comes with an offer for a one-year subscription to RescuePRO Deluxe data recovery software. With RescuePRO Deluxe, it's easy to recover lost photos or videos and save them to your computer's hard drive even if they were deleted months ago.